It’s a Honey of a Story! A bountiful “bivouac” of bees came to Sydney Creek Memory Care on the afternoon of September 7th. A visitor alerted us to bees swarming high up in the jacaranda tree located at the front of the building. Staff members Ann and Mike reached out to the San Luis Obispo County Agriculture Department who provided contact information for the Central Coast Beekeepers Alliance whose members are recognized for relocating bees. Within hours, botanist and beekeeper John Chesnut arrived at Sydney Creek equipped with a bucket pole and a collection box, but surprisingly without a bee protection suit. Chesnut is very comfortable doing what he does and says he is stung almost daily. “Like a lot of allergies, you either get worse or better. I just don’t react to stings,” replied Chesnut. He used lemon balm oil to attract the bees into a collection box and then transport them to his hives. Chesnut estimated that there were approximately 1000 bees. A “bivouac” is a military term used to describe a temporary camp without tents or cover. 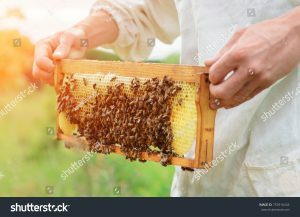 In this case, it is when thousands of bees leave their home and set up a temporary location from which they send out scouts to evaluate potential nest sites for the Queen. Bees are generally docile during this process and that can last for 24 to 48 hours. They have neither young nor food to protect, and their defensive instincts are minimal. 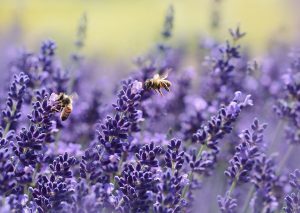 Bees and other pollinators play a critical role in producing many of California’s agricultural products and in maintaining a healthy environment. Insecticides, habitat loss and parasites all threaten honey bee populations. Beekeepers are losing bees at higher rates and having to scale back on honey production. For bees to make a comeback, human help is needed. It’s easy to do your part in saving bee populations by planting pollination-friendly plants like the California poppy and using relocation instead of extermination.